House plans with a see-through fireplace have a fireplace designed between two rooms with a hearth on each side. It can be placed within the wall, or it can be freestanding acting as a natural barrier between the two rooms. 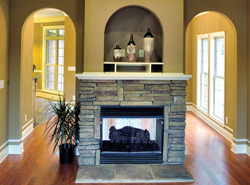 See-through fireplaces have become a popular feature in house plans as of late and provide a sense of comfort and warmth that radiates into several rooms of the home. Often they are shared by the hearth room and kitchen; while another place ithey are typically found is in the master bedroom and master bath adding tremendous ambiance to these areas. 2538 Sq. Ft., Width 52'-0", Depth 45'-0"
3638 Sq. Ft., Width 63'-0", Depth 90'-0"
4583 Sq. Ft., Width 115'-0", Depth 73'-0"
The has 4 bedrooms and 6 full baths. 6502 Sq. Ft., Width 110'-4", Depth 63'-11"
The Colley Craftsman Home has 3 bedrooms and 3 full baths. 1995 Sq. Ft., Width 46'-0", Depth 60'-0"
3747 Sq. Ft., Width 99'-2", Depth 46'-0"
The has 1 bedroom and 2 full baths. 2307 Sq. Ft., Width 60'-0", Depth 65'-0"
Our collection of house plans includes many home plans with see-through fireplaces. We offer detailed floor plans that allow the buyer to visualize the look of the entire house, down to the smallest detail. With a wide variety of plans, we are sure that you will find the perfect house plan with a see-through fireplace perfect for your style.